PRODUCT: Chem Link F1351WH, E-curb 9" ID Round Pipe Flashing Curbs, Complete Kit In White. 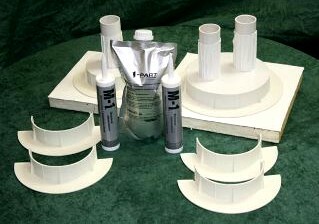 Kit Has 2-pair 9" ID White Molded 2-piece Interlocking Curbs, (2) 1/2G Pouches White 1-part Pourable Sealer, (2) 10-oz Tubes White M-1 Sealant, 1/2-pint TPO Primer. Price/Kit. Contains Flammable Item, UPS ground shipment only. DESCRIPTION: Chemlink 9" Chemcurb-e Kit Includes All The Items Needed To Create 2 Complete Penetration Seals. The White Color Curbs And Filler Are Ideal For TPO Roofing Systems.